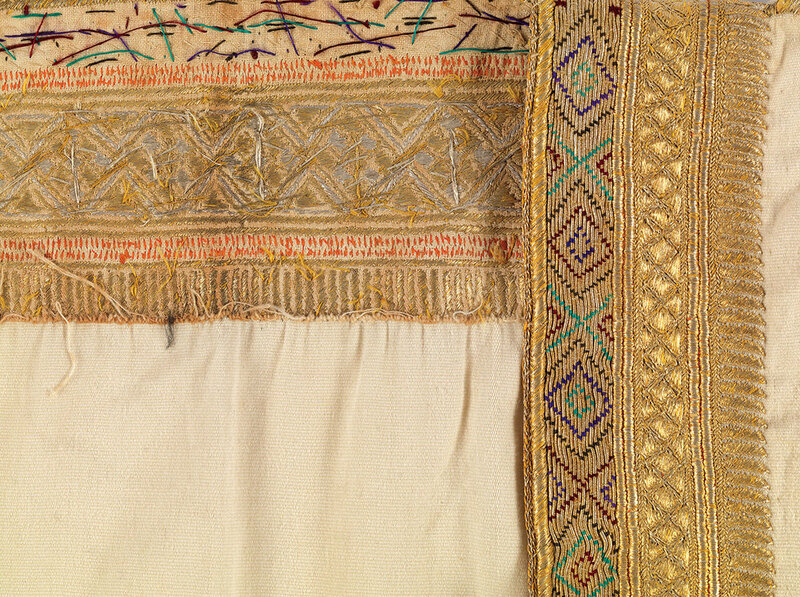 MAN’S CLOAK (abaya) of silk, cotton, metallic thread, weft-faced weave, slit tapestry technique, Ottoman Syria, early twentieth century. MAN’S CLOAK (abaya) of silk, cotton, metallic thread, weft-faced weave, slit tapestry technique, tablet weaving, Ottoman Syria, nineteenth century. WOMAN’S JACKET (salteh) of silk, cotton, metallic thread, weft-faced weave, slit tapestry technique, Ottoman Syria, late nineteenth to early twentieth century. MAN’S CLOAK (abaya) of silk, cotton, metallic thread, weft-faced weave, slit tapestry technique, early twentieth century. MAN’S COAT (damir) of wool, cotton, metallic thread, weft-faced weave, toothed tapestry technique, Bedouin peoples, Aleppo, Ottoman Syria, late nineteenth to early twentieth century. MAN’S CLOAK (abaya) of silk, cotton, metallic thread, weft-faced weave, slit tapestry technique, early twentieth century. MAN’S CLOAK (abaya) of silk, cotton, metallic thread, weft-faced weave, slit tapestry technique, early to mid-twentieth century. MAN’S CLOAK (abaya) of silk, cotton, metallic thread, weft-faced weave, slit tapestry technique, early twentieth century. MAN’S COAT (damir) of wool, cotton, metallic thread, weft-faced weave, slit tapestry technique, handsewn, Bedouin peoples, Damascus, Ottoman Syria, late nineteenth to early twentieth century. Photographs courtesy of the Fowler Museum at UCLA. How we dress tells a story that, in the case of traditional clothing, can stretch back thousands of years. The world’s culture has been built, layer upon layer, as pivotal moments of history effect changes on textiles like the rings of a tree’s trunk. For a certain country residing in the Levant, that history goes farther back than most. Currently at the Fowler Museum at the University of California, Los Angeles, “Dressed with Distinction: Garments from Ottoman Syria” is an awesome display of clothing predating the rise of the modern Syrian state. One California day, cloaked in the clouds of an unseasonably wet winter, I had the chance to see the garments up close and prior to installation, courtesy of Joanna Barrkman, Senior Curator of Southeast Asian and Pacific Arts. Donated to the Fowler by Dr. David and Elizabeth Reisbord, both of whom live in Santa Monica, their collection came as something of a mystery. In the spirit of properly documenting and identifying the twenty-eight garments that were donated (twenty-three are exhibited), the museum partnered with Dr. Gillian Vogelsang-Eastwood of the nonprofit Textile Research Centre in Leiden, the Netherlands, due to her expertise in Middle Eastern clothing and fabrics. Syria’s long history and geographical position has served to enrich its textiles, lending an edge of refinement that can take one’s breath away. As the hub for multiple trading routes, Aleppo and Damascus received a bounty of raw materials and foreign influences. Two of the coats in the exhibition bear the vibrating patterns of ikat dyeing, where it is known by the Arabic term tarbit. Locally produced in both Aleppo and the city of Homs, these long, flowing clothes, with a narrow neck and a cut that tapers from a wide base to a narrowing beneath the arms, show the inclusion of lining cloth that originated from abroad. Barrkman mentions that a concurrent exhibition of Central Asian ikats at the Los Angeles County Museum of Art, also based on a gift by the Reisbords, features Russian cotton prints on the interior. From Uzbekistan to Syria, global trade made its mark on local textiles. MAN’S CLOAK (abaya) outer front and inside back, of wool, cotton, metallic thread, weft-faced weave, slit tapestry technique, hand embroidery, late nineteenth to early twentieth century. MAN’S CLOAK (abaya) of silk, cotton, metallic thread, weft-faced weave, slit tapestry technique, early twentieth century. WOMAN’S SILK HEADCOVERING (hatta) of silk, cotton, metallic thread, weft-faced weave, lance, Homs, Kasrawabiye/Homsiyye style, Ottoman Syria, mid-to-early twentieth century. The silk itself was a foreign introduction. Silk production eventually was cultivated in Syria, but had been originally introduced through the Silk Road and Chinese trade. 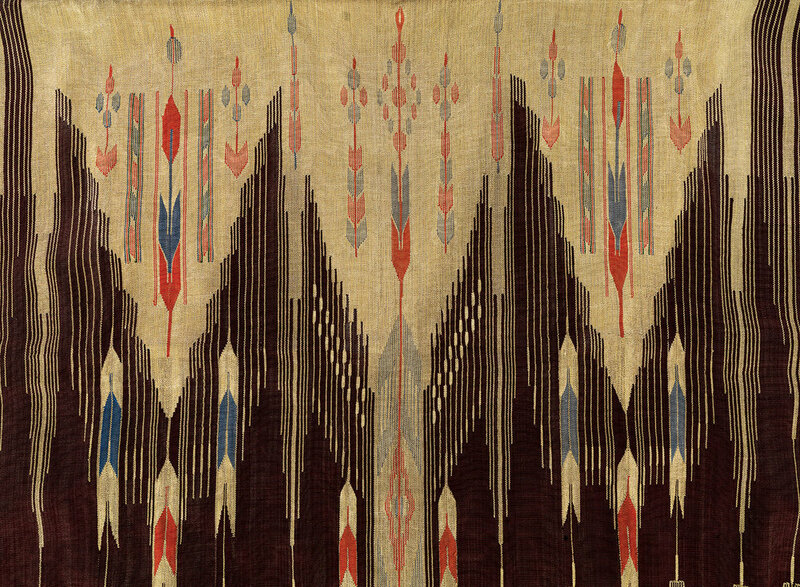 One of these ikat coats, a woman’s garment known as a qumbas, is an outlier among the collection. From post-Ottoman Syria, around the 1950s, an identifiable trait is its vibrant aniline dyes, which were in widespread use in the Middle East by the end of the nineteenth century. Unlike its sister garment, the piece sports delicate crimson cordwork along the cuff. The cordwork is associated with the Jordanian town of Ma’an, but it was possibly a response to the influence of being introduced to French exports, including lace. Standup collars were a notable adoption into Syrian fashion, brought on by Arab admiration for the stiff collars of French military uniforms. A Bedouin woman’s jacket, one of two appearing in the exhibit, coquettishly sports this cultural adoption. These jackets differ from the largely silk garments of Syrian Arabs by being woven from sheep’s wool. Their cut, while still bearing a rectangular shape, possesses short sleeves, a nod perhaps to the more rugged life of these nomadic people. Bright pink flowers nestled in sea-green leaves chase each other up and down the lapels, flanked by detailed geometric designs. By this time aniline dyes from Europe largely replaced the natural dyes that had been used for hundreds of years. Most of the clothes in the Reisbords’ collection are thus aniline dyed. The close aesthetic kinship between the Bedouins and urban Arabs is immediately apparent when one is introduced to the mainstay of the exhibition, the glorious silk abaya. These open-faced robes with voluminous sleeves appear in repose like a flat square, cryptically remote from the items of apparel that they actually are. Their construction is not unfamiliar, with long rectangles of cloth pieced together, bearing a close resemblance to the kimono. They, like the kimono, are overgarments, meant to be worn over a blouse or shirt, and in use by both sexes. When not being worn, abayas appear inert, like carpets or tapestries rather than items of clothing; but when draped on the human form, they transform the wearer into a canvas upon which intricate designs, shimmering surfaces and bold colors dance. One can imagine how the streets of Damascus and Aleppo must have been filled with a bright parade of fashionable men and women. WOMAN’S COAT (qumbas, kumbas) of silk, cotton, ikat, warp-faced tabby, tabby weave, Ottoman Syria, Aleppo, before 1960. Many of the abayas are recipients of tapestry-weave, a technique so-called due to its traditional employment in tapestries. The weave is weft-faced, with no warp threads visible, and discontinuous, having different colored threads only in the areas of the surface design. This allows for complicated imagery and geometric patterns, rather than a repeated motif that extends end to end. With its application to a piece of clothing, the results are nothing short of magical. Sweeping triangles of the most subtle shades trail off into spiderweb thin strands of the same, with stylized flowers and shafts of grain spilling bright colors across the background. This is just the tip of the legacy of textile production in Syria. Aleppo was well known as a center of textile industry since the thirteenth century, an eight-hundred-year pedigree of excellence. Beyond its fame for masterful tapestries, Syria was also known for its tabby-weave, or hermezi, a method where weft threads go over and under each individual warp thread. Laborious and time-consuming on a scale that is difficult to comprehend, Syrian artisans made their trade weaving these superlative textiles, which were also incorporated into their clothes. One particular piece in the exhibition, a magnificent golden abaya with silvery columns enfilading in procession down the front and back of the garment, is an example of moiré and metallic threading. The otherworldly rippling surface of moiré is caused by pressing a wooden or metal plate or roller, incised with a pattern, to two layers of fabric under heat. WOMAN’S BODY COVERING (çarshaf) of silk, cotton, metallic thread, weft-faced weave, interlocking tapestry technique, Ottoman Syria, early twentieth century. While these garments are different in cut, color and styling to modern wear in the twenty-first century, it is good to remember how much they inspired European dress at the turn of the twentieth century. Fascination with the Orient, that loose construct that played in one’s imagination as catchall for exoticism, led to a relaxing of the shape of European apparel. Boutiques took note of the voluminousness of Middle Eastern sleeves, a different approach to structure that no doubt had a few tailors stroking their chins thoughtfully. This shift away from tight corsets and forms that built upon and restricted the body was due at least in part to the interplay between cultures. The message behind the exhibition is a subtle but important one; fabric weaves all of humanity together. The clothing in the collection, beyond its brilliant workmanship and sumptuous aesthetics, represents a culmination of historical trade, exchange and knowledge. Syria’s textile tradition has gone back over a thousand years, with the ancient cities of Aleppo and Damascus having survived over different incarnations. Throughout this expanse of time they built and refined an industry measured in lifetimes of skill. In this way it is rather like a tree’s rings, but in a form so beautifully abstract that it tugs the heartstrings. This historical legacy has an impact on the present, one which Barrkman and Vogelsang-Eastwood are anxious to share. The living tradition of textile production in Syria has suffered greatly due to the civil war that has engulfed that region since 2011. These marvelous items of clothing represent a thread that may yet be severed. To the Syrian community in the United States, Barrkman hopes this exhibition provides them with a connection to their past, their memories and to their culture. “Dressed with Distinction: Garments from Ottoman Syria,” shows at the Fowler Museum at UCLA, 308 Charles E Young Dr. N., Los Angeles, California 90024, through August 18, 2019. Visit their website at www.fowler.ucla.edu. You can read more about the Textile Research Centre at their website, www.trc-leiden.nl/trc. GILLOW, JOHN. Textiles of the Islamic World. London: Thames & Hudson Ltd., 2010. SULEMAN, FAHMIDA. Textiles of the Middle East and Central Asia: The Fabric of Life. London: Thames & Hudson Ltd., 2017. VOGELSANG-EASTWOOD, GILLIAN. 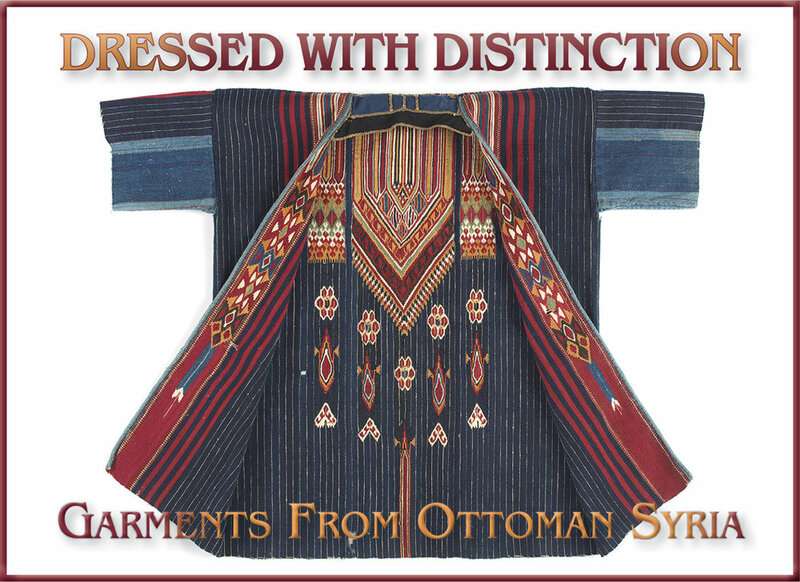 Dressed with Distinction: Garments from Ottoman Syria. Los Angeles: Fowler Museum at UCLA, 2019. Patrick R. Benesh-Liu is Associate Editor of Ornament and continues to find time to enjoy craft in between writing, travel and tech support. His most recent journeys have taken him through two exhibitions, one in New York City, and the other in Los Angeles. The common thread? World history in personal adornment. At the Neue Galerie, a private museum dedicated to Austro-German art and craft, a small one-room exhibition laid out the major players and the evolution of jewelry produced by the Wiener Werkstätte. Building on the principles established by the Vienna Secession, the Wiener Werkstätte was instrumental in the development of contemporary art jewelry. A subsequent visit to the Fowler Museum at UCLA explored the influence of the Ottomans on Syrian clothing and textile production. From east to west, and west to east, he was impressed by the cross-section of human ingenuity and creativity. SILK COAT with silk embroidery, France, circa 1800. ZOOT SUIT of wool and twill, with spectator shoes of leather and suede, United States, 1940-42. Photographs courtesy of the Los Angeles County Museum of Art, © Museum Associates/LACMA. The show covers three hundred years of male style, from the macaroni to the metrosexual. Despite the subtitle, it is not limited to fashionable dress; there are some utilitarian pieces, including a redcoat’s red coat, a Brooks Brothers blazer, blue jeans, and, yes, a couple of gray flannel suits. But they are juxtaposed against examples of cutting-edge fashion, both historical and contemporary. HELMUT LANG VEST of leather, synthetic/cotton felt, bottle caps, laminated foil, from Spring/Summer 2004. JOHNSON HARTIG FOR LIBERTINE ENSEMBLE (detail) of silk twill jacket, silk vest, cotton shirt, silk twill, satin, and damask scarf, Fall/Winter 2009-10. JOHNSON HARTIG FOR LIBERTINE ENSEMBLE (detail) of wool twill and felt, mother of pearl buttons, with wool cap, Fall/Winter 2012-13. 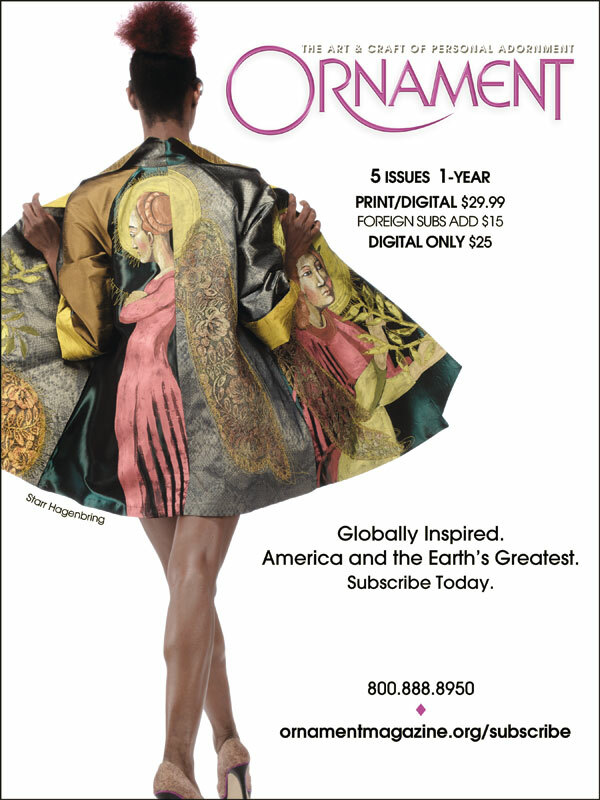 Kimberly Chrisman-Campbell is an art historian specializing in fashion and textiles, anda frequent contributor to Ornament. She has worked as a curator, consultant and educator for museums and universities around the world. In this issue, she goes behind the scenes of LACMA’s groundbreaking menswear show, “Reigning Men: Fashion in Menswear, 1715–2015.” Chrisman-Campbell is the author of Fashion Victims: Dress at the Court of Louis XVI and Marie-Antoinette, published by Yale University Press.